Due to their inexperience on the road and poor decision making skills, teen drivers are involved in serious auto accidents at a significantly higher rate than older drivers. If you or someone you love have been injured in an accident caused by a negligent teen driver, compensation is available. 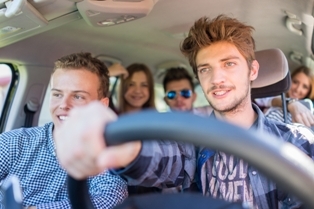 Teens have the highest crash risk of any group of drivers. Per mile driven, drivers ages 16 to 19 are almost three times more likely than those who are 20 or older to be in a fatal auto accident. In 2014, there were 2,270 U.S. teens ages 16 to 19 killed in motor vehicle crashes. An additional 221,313 teens were treated in emergency rooms for injuries suffered in auto accidents. Evenings and weekends are the most dangerous times for teen drivers. A 2014 study found that 50 percent of teen fatalities from auto accidents occurred between 3 p.m. and midnight. Accidents occurring on Friday, Saturday, or Sunday accounted for 53 percent of fatalities. Although teens represent just 7 percent of the U.S. population, they account for 11 percent ($10 billion) of the economic cost associated with auto accidents. Speeding. Teen drivers are more likely than older drivers to speed, with this behavior being seen most often in male teens and those who have one or more teen passengers. Speeding increases the risk of an auto accident by reducing the amount of time a driver has to react to a potentially dangerous situation. Speeding also increases the crash force when an accident occurs, which increases the risk of a serious or fatal injury. Distracted driving. Distracted driving is a problem for drivers of all ages, but teens most often struggle with this issue in relation to cell phone use. One recent study found that over half of all teenage drivers admitted to using their mobile phone while behind the wheel within the last month. About 25 percent admitted to texting while driving during the same time period. Drunk driving. A sense of invulnerability makes teenagers more likely to get behind the wheel after they've had too much to drink. In 2014, 17 percent of all teen drivers and 24 percent of male teen drivers had a BAC of 0.08 percent or more following an accident. However, at all levels of BAC, both driver impairment and crash risk are higher for teens than for older drivers. Lack of seatbelt use. One recent study found that just 61 percent of high school students stated they always took the time to buckle up. This is the lowest use of seatbelts in any group, which may explain why teens are so often seriously injured in auto accidents. Despite their youth, teen drivers are held to the same standard as other motorists. They are expected to know and follow the rules of the road, using reasonable care to prevent injuries to themselves and others. When they are at fault for an accident, they're responsible for medical expenses, lost wages, and the pain and suffering of any injured persons. However, cases involving teen drivers are somewhat unique because parents can also be held liable for damages. According to what is referred to as the Family Car Doctrine, parents share legal responsibility for damages in accidents caused by teen drivers. Vicarious liability may still exist even if a teen driver is not currently under the parents’ insurance policy.